Does the internet matter to the building automation industry? Has the growth in internet-based technologies made a significant impact on the industry? As John J. "Jack" Mc Gowan noted in his recent article 'The Internet Ties it All Together', "In the 1980's the topic of intelligent buildings was popular, yet it was not until recently that technology to accomplish many of these functions was available." While many in the industry view internet-based technologies as futuristic, albeit impractical ideas, there are products that are using the internet in ways that are low cost, low tech, and easily implemented. 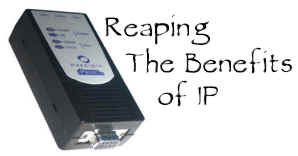 Consider IP Access products, devices that connect equipment with older interfaces like RS232, RS422 and RS485 to newer, Ethernet or dial based IP networks. Why would a Facilities Manager buy an IP access device? While the domain of the Facilities Manager has traditionally not extended to network access technologies, today we are seeing two trends that have come together to make the Facilities Manager more interested in new network technologies. First, there is a strong push, primarily since September 11th, for 'convergence' of security, energy and information technology. As John J. "Jack" Mc Gowan noted in his recent article 'The Internet Ties it All Together' "Most industry proponents believe that energy, security, and IT technology are converging-with the Internet taking center stage." While this push started with a post 9/11 concern for security, there are plenty of good reasons for these key building automation functions to work together: cost savings and improved efficiency being chief among them. IP access products meet the challenge of convergence, bringing equipment of various ages and protocols onto one common IP network for simple access from any location on the network. From CCTV cameras to badge card readers and HVAC controllers, formerly stand-alone (not able to connect to a modern network) serial equipment can communicate over an Ethernet LAN or other IP network. There are several benefits to bringing building automation equipment onto IP networks. Most of these advantages revolve around cost savings, increased productivity and flexibility. First, the cost savings. Rare is the Facilities Manager who does not face budget constraints in maintaining and improving building operations. Being forced to find ways to 'do more with less' is a common refrain. An IP access device offers its first cost saving advantage by working with existing equipment, extending the functional life of equipment that is perfectly reliable, yet lacks a network interface. Additional costs savings are realized with the reduced cabling and dedicated PC requirements that a networked device affords. With access to a metering datalogger, for example, from a PC in the Facility Manager's office, there is no need for a dedicated PC to retrieve data from that logger, nor is there a need to physically visit the datalogger. In the case of a large facility with multiple serial devices, this can offer a huge cost savings, as well as enhanced productivity. Any technology that will save hours in productivity means thousands of dollars saved monthly. IP Access devices introduce a radical shift in the way Facilities Managers administer and manage serial equipment, improving efficiency and offering unprecedented flexibility. We know that with IP access technology, Facility Managers can access their serial equipment from any location on the network. Just how easy is this, though? Companies like Precidia Technologies have built a reputation around designing devices that are virtually 'plug and play', and make it extremely simple to query the serial devices they are connected to. Simply enter the device's IP Address in a standard web browser, and you are inside the device and able to use your software application to download data or perform administrative tasks. With remote access devices, the IT and/or engineering departments are able to remotely configure the devices to access the equipment without having to leave the office - saving hours in support. The devices also have the capability to perform automatic routing of traffic to a backup system. These devices also facilitate remote diagnostics. Vast cost savings are realized by reducing the need to dispatch personnel on service calls, and reducing personnel required to provide onsite monitoring at remote locations. The devices can simultaneously route data to multiple destinations. They also allow for data and diagnostics to be handled simultaneously, in real-time. 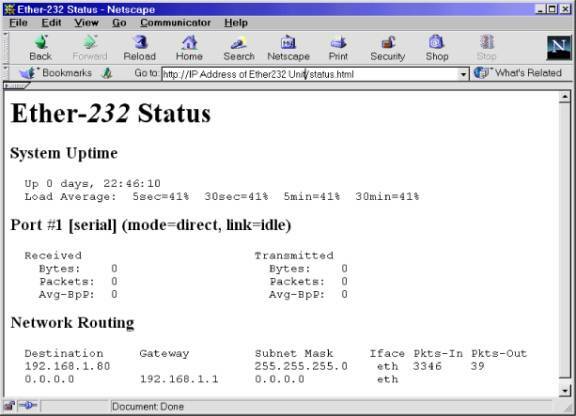 One of the remaining challenges is connecting legacy systems to the IP world. The ability to connect existing serial equipment (RS232, RS422 or RS485) to a network delays the need to replace existing equipment, reduces cabling and gives the equipment real-time access. Too often in the technology marketplace, a technician's approach to legacy equipment has been to throw it away and replace it with the "latest" new IP equipment. For companies with a large base of installed serial devices and systems, the cost of replacing this equipment is enormous. This is compounded when you consider the time and expense necessary to train front line and support staff on the new equipment. As a result, only a small percentage of companies have been able to implement full TCP/IP migration strategies. Connecting older, reliable equipment to TCP/IP may sound like turning a Goodyear Blimp into a Rocket ship but thankfully such technology does exist. There are numerous products on the market. They are known by several names: DEVICE SERVERS, THIN SERVERS, REMOTE ACCESS DEVICES. They are an ingenious solution that allows serial devices to communicate over IP networks. In essence, the devices convert data from one protocol to TCP/IP. UK based telecom service provider HTM Ltd., used Precidia's products to connect a hotel's legacy PBX system to the hotel's LAN, facilitating remote management for more efficient operations: "Our customers require simple, reliable & easily installed products", said Mike Vann, Technical Director of HTM Ltd. "Precidia's Ether232 allowed us to connect the customer's Mitel 3300 PBX to the Hotel's Call Management Solution using the PBX's telnet port. With no on site support, the hotel's PBX can now be monitored remotely by contract staff, saving HTM Ltd thousands of dollars in resource costs and staff time. The Ether232 met our customer's challenge, installing easily and performing well". Industry watchers agree that the internet is the engine of energy and security convergence in the buildings of today and tomorrow. The challenge is to adopt technologies that will leverage the internet protocol cost effectively, and seamlessly with existing equipment and systems. Facilities professionals must find technologies that can be easily implemented and maintained, without compromising existing infrastructure. IP access technology meets this challenge by presenting a cost effective, 'plug and play' serial to IP connectivity option that is seamless to existing equipment and systems.